It was a warm day for a picnic here on the school grounds, but a light breeze and good company made it enjoyable. The day started around 10:00 with pick-up ball games, open to anyone who cared to play. We had lunch at noon: everyone brought sandwiches and dessert, and the food was amazing! Lots of flavored drinks added pizzazz to the meal. The Fathers-vs.-Sons ball game began shortly after lunch. Early in the game, the students jumped to a big lead, scoring a pile of runs in the first couple of innings. It wasn't long, however, until their fathers got into gear and narrowed the gap. By the top of the seventh inning, the fathers had held off the sons, and had the tying run on first base, with the winning run at bat. This was a tense situation for the sons, and, with two outs and runners on base, could be the play that costs them the game. Alas, it was not to be: the fathers choked on a fly ball, stranding the runners and handing the win to their sons! And the crowd went wild. The sons, of course, were quite pleased with themselves. After a team photo and ritual signing of the game ball (it has been officially retired, and will be kept on display for posterity), the highlight of the day was over. A few more pick-up games were played, then we all went home to rest. This evening we celebrated the end of the school year by having our closing program and awards ceremony. The younger students charmed the crowd with their adorable action songs, and the older students also included some off-beat singing. 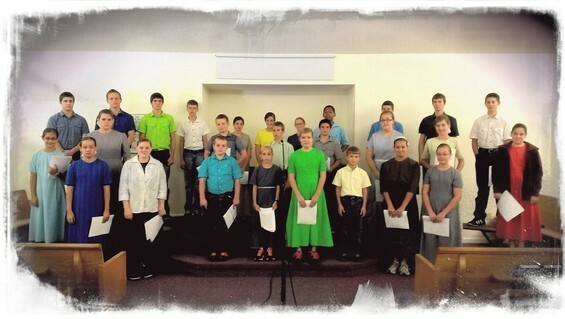 With Scripture recitation, solos, a duet, and a special song by the high school students, it was a good program. The students worked hard, and it paid off. 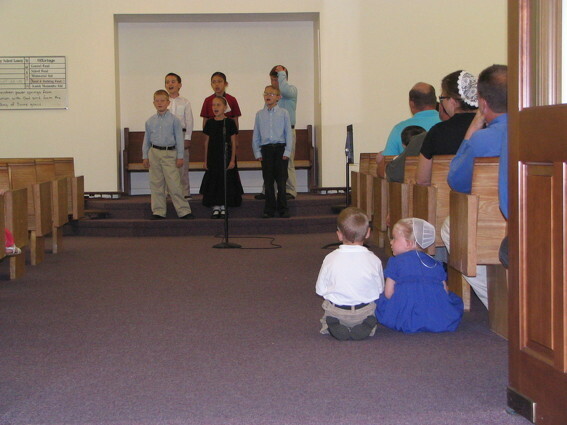 After each program, the students were given awards for character qualities, for Bible memorization, and for academic achievements. Tomorrow is the picnic and softball games, then summer vacation officially begins. Your Honor Roll students toured the manufacturing facility of Super Sensitive Musical String Co. today. President Jim Cavanaugh met us at the door, and, after distributing safety goggles to everyone, led us on a tour. 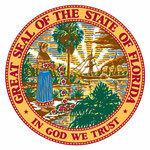 This company was founded in Chicago, IL, and moved to Sarasota in 1974. They employ 35 people in the manufacture of strings for violin, viola, and cello, along with mouthpieces for several saxophones. They also import pine tree rosin from Brazil, which they use as a base for mixing their proprietary formula of rosin. Mr. Cavanaugh showed us the machines they use to make these strings; many of their machines were designed by his father, so we were not permitted to take many pictures on the manufacturing floor. Their strings are made of various metals, including copper, tin, and aluminum. After the tour, we went to Sarasota Square Mall for a few minutes of window-shopping, then we ate lunch at the food court. We left the mall around 12:30 to go to Colonial Oaks Park gymnasium, where we played Team Two-Square and Extreme Indoor Kickball. We left the park just in time to get a Slurpee at 7-Eleven, before returning to the school by 3:00. Today was the annual End-of-Year field trip, and this year our destination was Epcot! Lots to see and lots to do here, and no one got to see it all. It was a very warm day, but with a fair breeze it was still quite pleasant. We left the schoolhouse around 7:15 am, and headed for Orlando, arriving at Epcot around 9:45. After scanning our passes and fingerprints, we went exploring! Some of the student's favorite exhibits were the Test Track by Chevrolet and the video tours in the World Showcase. Before meeting at the gate at 4:45, students were crusing the gift shops and picking out a souvenir or three while enjoying the air conditioning indoors. On the way home we stopped for pizza in Lakeland, eventually arriving back at the school around 8:00. It was a full day of excitement, tiring but good. Thank God for protection through it all! Track & Field Day was overcast with patches of sun coming through the clouds, and cool temperatures (chilly, really) with strong breezes. 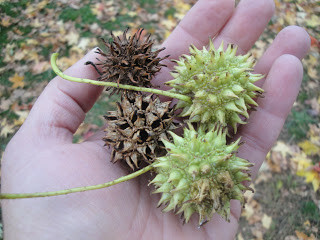 It was perfect weather for running, jumping, skipping, throwing, and shooting. The students gave each other a stiff dose of friendly competition while cheering for each other and their opponents. Lots of blue, red, and white ribbons were earned, creating big smiles and a rich supply of great memories! The school board organized a tasty lunch, and, with the help of school patrons, we all enjoyed hot ham-and-cheese sandwiches, veggies and dip, chips, and lemonade and grape drinks, with ice cream and bars for dessert. This feast was not, however, enticing enough to tempt everyone: some Kindergartners were so excited about their first Track & Field event that they couldn't eat more than a few bites, and then they were off to play again! Thank God for His generous protection - there were only a couple of fairly minor injuries sustained. With the cheerfulness of students competing fiercely, the willing help of parents, the beautiful weather, and fine fellowship, it was truly a day to remember. Last night we hosted our 7th Annual Fundraiser Banquet, which was well-supported. Our menu included grilled barbecued chicken, barbecued pulled pork, and grilled seasoned baked potatoes, thanks to the generous craft of skilled caterer Alvin Zook of Virginia. 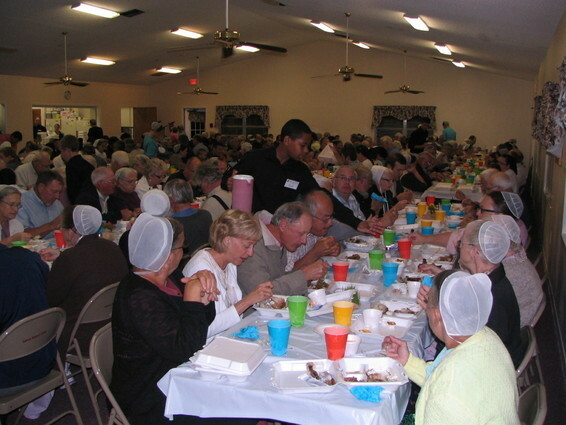 Our guests also enjoyed green beans with bacon, Mrs. Mullet's Famous Cole Slaw, and strawberry shortcake for dessert. It made for a splendid feast! The school board played a game of "Are You Smarter than a Fifth Grader?" with our banquet guests, and handed out prizes to folks who were smart enough to get the answer both right and first. A little later in the evening, we were all treated to special singing by a male quartet. Following that, it was suggested that the Nathan Overholt family sing a song for us, which they did, their little ones singing quite heartily. Good food, great fellowship, and all for a worthy cause: giving our children a first-rate education that is built around God and the Scriptures. Thank you all for your support; your rewards are eternal! 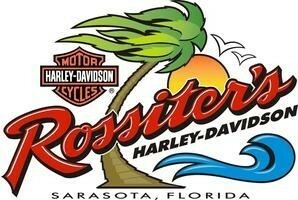 Your Honor Roll students went to Rossiter's Harley Davidson dealership and service center today for their field trip. Our guided tour was scheduled to begin at 9:30, so, since we had about half an hour of free time, we went to The Hill for a morning walk. We made a leisurely circle around the top, then went back down to the parking lot to leave for our appointment at Rossiter's. Jimmy, the Marketing Director, met us at the door and welcomed us in; he's been with Rossiter's since 1998. He gave us a brief history of Harley Davidson, telling us that the business was founded in 1903 by a fellow named Mr. Harley along with three brothers by the name of Davidson. Harley Davidson motorcycle company is the oldest motorcycle company in the United States in continuous operation. They sell more "cruisers" than all the other motorcycle manufacturers combined, including Honda, Yamaha, Suzuki, BMW, and others. Jimmy led us around the sales floor while he talked about the company, then took us out to the service and detail area, where we could see bikes that had come in for maintenance or repairs. In the service area we met a technician named Phil, who showed us the dynamometer, which is used to measure engine torque. This machine allows them to finetune the engine's fuel mix for optimal performance. He had a motorcycle on the stand, and let us watch while he ran the engine and checked the numbers on the monitor. Rossiter's dealership is certified to offer training toward a motorcycle license, and they give lessons to prepare students. They also rent bikes for folks who want to test them or just enjoy a ride or a bike event. After the tour, we went back to the sales floor where some of the students got to sit on a motorcycle for a photo. After browsing the t-shirts, we headed out to the mall for a little window shopping before eating lunch at the food court. 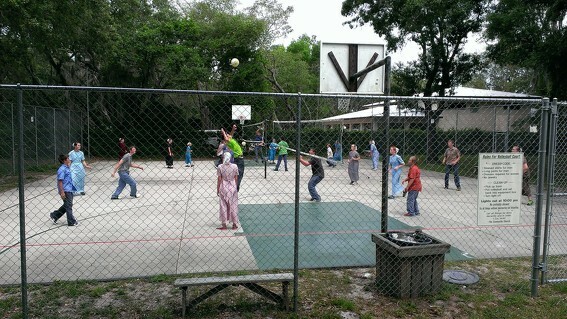 From there we went to the Colonial Oaks gym for basketball and Extreme Indoor Kickball. Of course, we finished the day with Slurpees. Grades K-3 are celebrating February Fun Days; their teachers are working hard to keep the Winter Blues away. 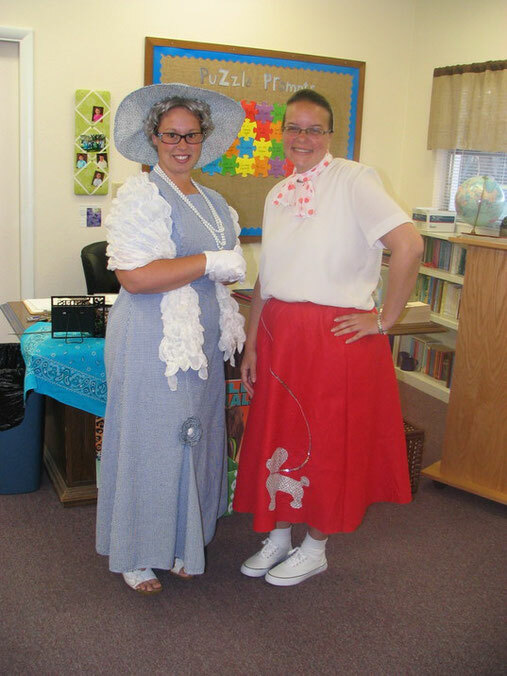 See the pictures and follow the fun on our School Snapshots page. We'll add to it as the month continues, so check back soon! Today is the end of the second quarter, which means we are now officially half-way through the school term! Miss Susie's first grade students put on a special reading session today for their friends. They read a story about a proud fox. 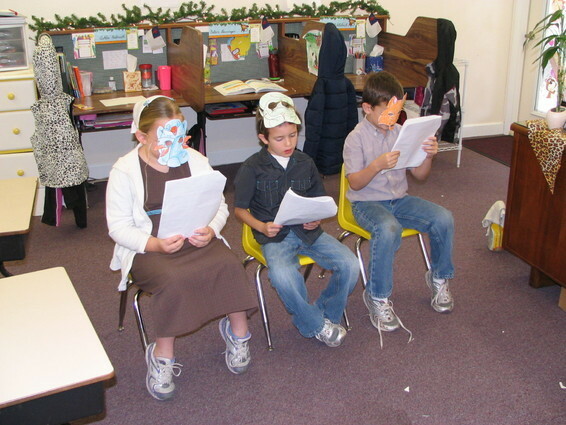 Each of the first graders wore a paper mask that represented a character in the story. It was fun! This morning, just as school was starting, one of the school moms reported seeing a rather quirky-looking fellow hanging around the side of the church house. Within a couple of minutes, he showed up at the door during Monroe M.'s chapel talk, and started asking questions. 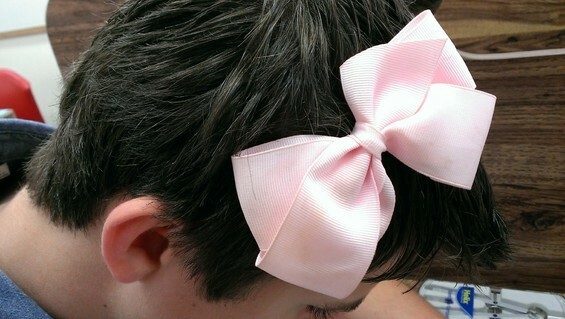 He wanted to know why the ladies wear "those coffee filters" on their heads, and why the men don't wear them also. Then he had questions about Jesus, and the Bible, and why we do the things we do. Good questions. Tough questions. Monroe handled the situation really well, and the students even asked this fellow a question or two. Since he couldn't think of his own name, he was given the name "George," until Colton raised his hand to suggest that we call him Perry. Your Honor Roll students went on a Field Trip today. In old Cortez Fishing Village, we visited the Cortez Coast Guard Station. Our tour guide was crewman Mr. Harry V., who welcomed us to the station. He was originally recruited out of Atlanta, GA, and the Coast Guard sent him to serve in Cortez. As soon as we stepped inside, we were met by their mascot, a chocolate Lab named Buoy. (Buoy - pronounced "BOO-ee" - followed us around until we left the building.) Harry showed us the offices where paperwork is processed and where radio calls are received. On average, they get called out approximately two or three times a week for helping folks in distress. Last week, they helped a gentleman who radioed in because his kayak flipped while he was fishing, and he couldn't get it righted by himself. Also last week, a couple of guys in a john-boat were in the water because they ran out of fuel, and since they couldn't keep their boat oriented into the waves, it turned over. The Coasties found them floating in the drink, clinging to the upside-down john-boat. There are around 35 people assigned to the Cortez Station, and usually about 15 of them are on call. They are on duty for 48 hours, then off for 48 hours. Harry showed us the supplies room (life jackets, helmets, bullet-proof vests, and whatnot), the recreation lounge (sofas, big-screen TV, and whatnot), then escorted us through the mess hall and kitchen (a pool table, eating tables, coffee machine, and whatnot), on to the work-out room (weights, stationary bicycle, rowing machine, and whatnot), and finally out to the garage/repair area (tool chests, work benches, parts washer, and whatnot), and finally took us outside to see the boats. Out on the dock, Harry introduced us to their practice dummy, whose name is Oscar. Oscar was a nice guy, so Megan and Kelsey had their picture taken with him. The station has four boats; two are in the water at all times, while the other two are out for repair and maintenance. The larger of the two boats was powered by two 800 hp diesel engines. The men were impressed. Harry let students board the boats and check out the cabins. After posing out front with the station's sign, we headed back to Bee Ridge for lunch at Firehouse Subs (by popular demand). From there we spent the afternoon at Colonial Oaks Park playing basketball, Extreme Indoor Kickball, and Team Two-Square. The students wanted to finish the day with a Slurpee, so we did that, too. It was the coldest day of the winter, so far. School closed at noon today for Christmas vacation, and the students presented their annual Christmas program this evening. From youngest to oldest, they all worked hard, and did a wonderful job! 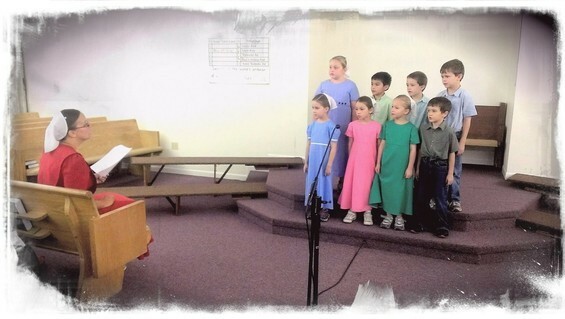 It was a real treat to see the Kindergarteners reciting Scripture, and hearing the older students sing - wow! More than one listener said it brought "glory bumps" on their arms to hear the beautiful singing. Now school vacation has begun: time for family gatherings, sharing, story-telling... and make time to enjoy the Presence of God - Emmanu'el, God with us! Grades Two and Three had a fun Christmas party today, decorating cookies! 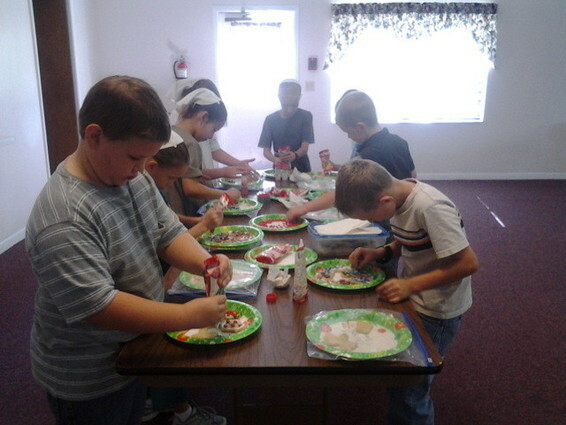 Miss Resha baked them and brought them to the Fellowship Hall this morning, then invited her students to exercise their creativity by adding colored icing, cinnamon candies, and sprinkles to make gingerbread men, stars, bells, snowmen, angels, candy canes, Christmas trees, and more. They had a great time, and everyone got to take their own creations home with them! Today was an exciting day for the Kindergarten class: it was their first day to do actual, for-real seatwork in their offices, by themselves! Also, it was their first day to have an official reading class together! This is a big step, people! It means they can read and work by themselves. 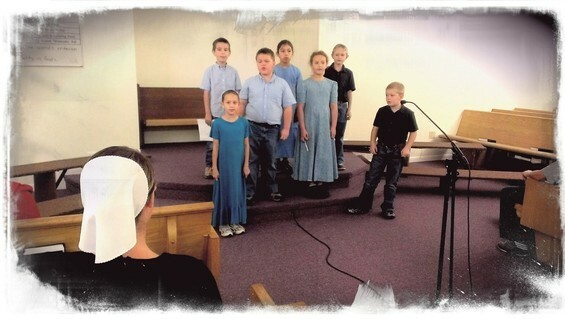 Practice for the Christmas Program is well underway. The students are doing well; this is a program you won't want to miss! The program will be held on Friday evening, December 20, at 7:30. Please have your students here by 6:55, for final preparations. Thank you! Your high school students went camping at Lakewood Retreat this weekend. They made lots of good memories together: volleyball-in-the-sand, round-table ping-pong, basketball, two-hand-touch football, and even frog gigglin'. We ate supper in the dark, but it was still good: hamburgers with all the fixings. After supper, everyone hung out in the game room for awhile, then the guys played basketball while the ladies played a l-o-o-o-o-ng game of Hippopotamus. The game took awhile because the ladies were attempting weird basketball shots - and sometimes even making them!(Ex. : backward shots from the 3-point line (Megan), no-look kneeling backward shots from the foul line (Veronica), and so on) After the fun and games, they huddled around the campfire until they could hardly stay awake, then the ladies headed for their tent while the men waltzed around in the men's room at the bath-house, with their sweat-pants pulled up to their underarms and the drawstrings around their necks. (Ok, only some of the men did this.) They enjoyed themselves so much the ladies had to shush them after quiet time. Saturday morning the ladies slept in until about 9:30 [edit: the ladies are now insisting it was earlier than this! ], while the guys sat around the fire, ravenously hungry. When the ladies finally emerged from their den to head for the bath-house, they were treated to a rousing round of hearty applause from the men. This quickly became a morning ritual. Breakfast was Bird Dogs and Iced Coffee; Matthew did his best to finish the Iced Coffee rather than save any for Sunday morning. He enjoyed it; Jason was rather concerned about how quickly it was disappearing. After taking group photos back at the tree house, they tossed a football for awhile, then headed up to the game room for more ping-pong. Supper was grilled chicken with Texas Toast and salad. This was followed by volleyball, then three of the Freshmen decided they wanted to go frog gigglin'. They came back with a haul of frogs, which they beheaded with their pocket knives, and, after disembowling and skinning them, they carefully packed them away in the fridge. Dealing with the frogs was somewhat stressful for Anthony: he does not get along with frogs, and one of them slipped out and jumped right toward him! *shudder! * After snacks around the fire, they hit the sack. Sunday breakfast was Cinnamon Rolls, Lil' Smokies, and orange juice, with just a little bit of Iced Coffee remaining; the Iced Coffee was carefully divided out amongst them, so everyone who wanted some got a swallow or two. We had chapel around the fire, then a little free time before fixing a lunch of Taco salad and left-over Texas Toast. The Freshmen pan-fried their frog-legs and professed great satisfaction in eating them. Most everyone around the table had a (tiny) bite, including Kelsey! We broke camp and left at 2:00, arriving back home at 3:30. It was good. 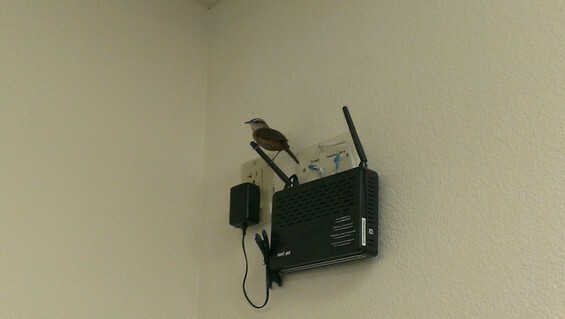 A pretty little singer named Sweet Caroline joined us in the big classroom this morning. 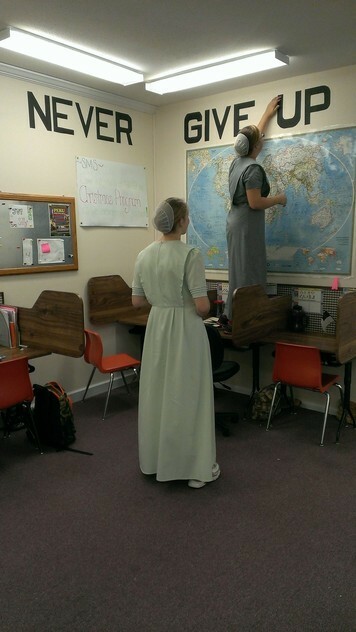 We didn't hear much from her, but she visited every corner of the room; the students were enchanted. She stayed for only a few minutes, sadly. Special days - really special days - don't come around very often. Today was one of the really special days; it's called Take Your Teddy Bear to Work Day! If you didn't take your teddy bear to work, you missed out on something really special. 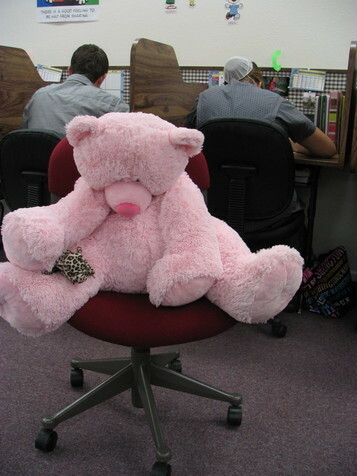 The students in grades four through high school brought their teddy bears to work today, and had a great time with it. Among those present for roll call were a rabbit, a penguin, a frog, a polar bear, a couple of birds, two giraffes, an elephant, a shark, two adorable little piggies, a dragon, a horse, a screaming monkey that flies, and other weird and wonderful creations. Check them out. Miss Susie's classroom, Kindergarten and First grades, celebrated with a Fall Festival this afternoon. 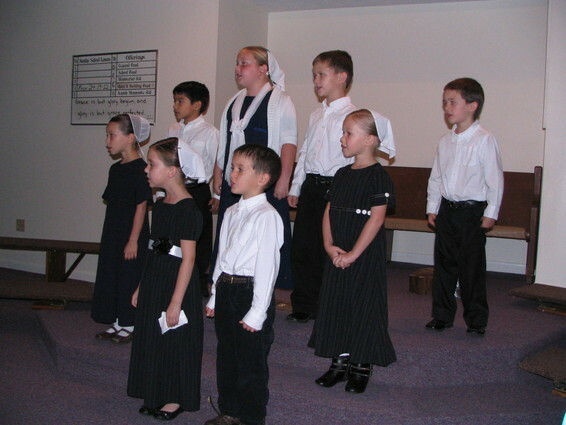 Their parents were invited to the Fellowship Hall, which was decorated in an autumn motif. The students had been diligently practicing a special song, The Twelve Days of Autumn, and today they finally presented it to their parents and the other students in Second and Third grades. It was a delightful presentation, and the parents, naturally, were charmed. After this special rendition, Miss Susie put out treats: apple cider, popcorn, and candy corn, which the children dug into without hesitation. Before they knew it, the time had flown by, and it was time to go home. 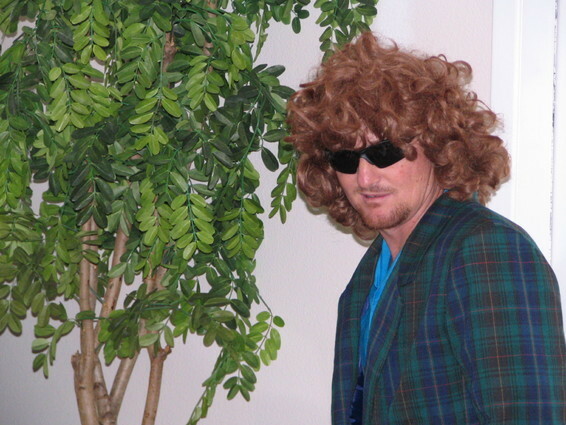 Today was picture day, and, thankfully, every student was present! Today the Honor Roll students of last year's fourth quarter went on their field trip to the Sarasota County Jail. Arriving around 9:00 in downtown Sarasota, we hustled from the parking lot through a light rain to the front desk, where the officer working the reception desk rang up our tour guides. Currently, the jail houses approximately 1,020 inmates, about 80% of whom are waiting for trial; the other 20% have been convicted and are serving short terms. The longest term that an inmate can serve is 11 months, 29 days. Anything longer, and they have to be moved to a prison to serve their time. The jail is "like its own little city," they told us. Inmates do the laundry for the entire jail population, along with preparing roughly 3,000 meals per day for inmates and staff. Some inmates (trustees) mop the floors, wash the walls, paint the interior, and so on. They started the jail tour by taking us through the booking process. Javin H. offered his string of beads for the booking officer, who wrote his name on a huge card, then shrink-wrapped the beads to the card. This is how personal effects are handled when someone is arrested and booked. Next, Rhonda M. stepped in front of the gray screen for her booking photo, then was digitally fingerprinted (for illustrative purposes only; not recorded). Before deleting her file, they printed her set of fingerprints and gave them to her. Also in the booking area, they showed us the holding cell. After inviting the whole group into the holding cell, they slammed the big steel door and locked it, leaving some students chuckling nervously. After releasing us moments later, they showed us the restraint chair, with velcro straps for the ankles, wrists, abdomen, and shoulders. This was demonstrated on Wesley M., and is used for uncontrollable arrestees. Every person who is booked into jail gets a bedroll, into which is rolled a few necessities: a sheet for the bed, a blanket, a tiny toothbrush with a tiny tube of toothpaste (they gave one each to Daniel M.), and one or two other things. Each person also gets a thin, vinyl-covered "mattress" pad, maybe an inch and a half thick; if they're lucky, they get a pillow, because there aren't enough for every inmate. We got to see the laundry center, the medical wing where high-risk patients are monitored, the psych wing, the trustee cell block, and even the kitchen. They also showed us the recreation area on the roof, completely covered by chain-link fence high overhead, laced across massive steel beams. The view was completely blocked by the high cement block walls around the area, so that only the sky could be seen. 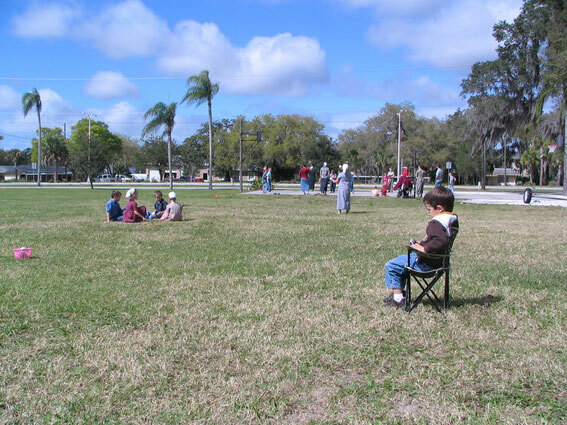 Inmates get very little time "outside" in the recreation area. They have a basketball goal, but no basketball, because they get into fights with competitive sports. Back downstairs, just before we left, Deputy Brandt showed us his taser. He said any officer who carries a taser is not only trained in its usage, but must also accept tasing himself, so he knows how it feels. Outside again, the students voted to go to Chick-fil-A for lunch. Then we went to the Colonial Oaks gym, where we had the place to ourselves. The students played Extreme Indoor Kickball (boys against girls), basketball, and Team Two-Square. We finished the field trip with Slurpees for 7-Eleven. The Kindergarten students marked today as the frst day of their formal education, beginning a 13-year trek to a high school diploma through hundreds of workbooks, over 2,000 days and more than 14,000 hours in the classroom. This is a big deal, people. Some of them came eagerly, some a little nervously, but all with a game smile on their face, ready for the adventure. 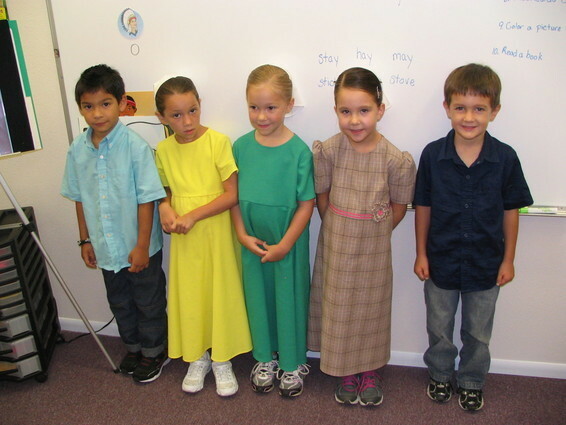 After reviewing a few basic classroom guidelines, they were soon singing the ABC song, the Gumdrop song, and others. And they enjoyed it! After school, they met rigorous questioning ("How was school today?") with a prompt "Good! ", and a smile to prove it. Great work, Miss Susie! And it was good: during last period, they enjoyed brownies and ice cream, courtesy of Nathan and Janet O., who offered the treats in honor of the Kindergarten class. The Kindergarteners shared it with grades 1-3, and they had a regular party! How was school today? Good! L to R: Macario G., Tiffany Y., Jenny S., Abby G., Mason K., SMS Scholars! Today being National Toasted Marshmallow day and all, the students celebrated by toasting marshmallows this afternoon! Miss Susie's room had a marshmallow toasting ceremony in their classroom, setting up on desks with tea lights and tiny marshmallows speared on tiny sticks. With a little patience, they enjoyed their toasted marshmallows in the comfort of their air-conditioned classroom! Mr. Jason's students assembled on the porch to find a circle of clay flowerpots with charcoal briquets smoldering inside. They helped themselves to bamboo skewers and marshmallows, and were soon producing delicious-looking smores encased in chocolate-coated cookies. Miss Resha's class was invited to the party, too, so they joined us and circled up for the fun. After the party, everyone finished the end-of-day chores, then the first full week of school was over! Enjoy your holiday weekend, everyone! School opened today! The students arrived with an air of nervous excitement, and the classrooms were noisy with chatter. The younger students were soon outside playing, while the older students hung out at their desks, waiting, waiting... Then the bell rang, and it was time. Our Administrator, Bill Y., joined us for chapel this morning, and gave a talk based on Bible-era Daniel, who purposed in his heart to do the right thing, even when it wasn't easy. Bill urged us to follow Daniel's example, and make wise choices and good use of our time, to live for God. 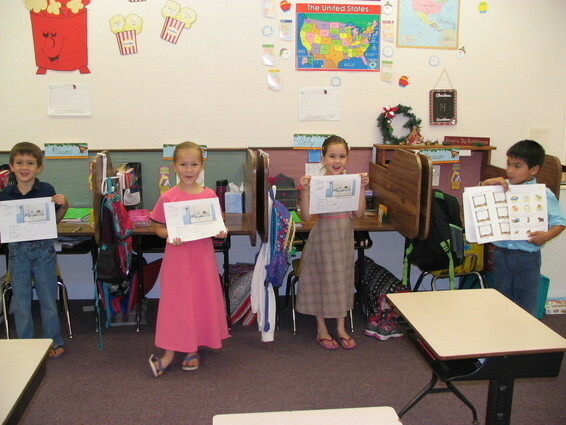 Back in the class rooms, it was time to get re-acquainted with each other, our work-books, and class room procedures. The students willingly dug into their work, and made a very good start to the year. 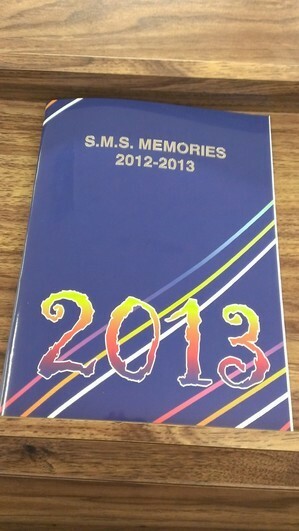 The 2012-2013 SMS Yearbooks have arrived, and are available now. Thanks to our sponsors, we are able to keep our costs low enough that we can make these available for a donation of only $10 each. The yearbook staff worked hard to put together a book of memories that you will enjoy for years. Make sure your students each get a copy. Students, and teachers, and parents, oh my! The school house was filled with happy sounds this evening, as families came to meet and mingle with friends. Students popped in and found their desks, then went looking for their classmates. Thanks to the school board, we also enjoyed cookies and punch. It was a good evening, and it seemed as though the students were actually looking forward to being in school again! That's a good thing. It's going to be a great year! See you all Wednesday morning! We had a great group of patrons to work with today at the school house! School house cleaning got done thoroughly and efficiently, so thanks to everyone who came out to get the job done. Many hands made the work light and enjoyable. It really looks great!